I'm coming to the end of my time here in Firenze. I've been working here for the last month as a tour guide in the Duomo of Florence. You pull up your socks, buckle up your bum bag and head out early, ready to take the day by the horns. But after a couple of hours you're getting irate — you can't find a toilet and are struggling to locate that 'famous' pizzeria that your friend (who visited Florence 30 years ago) recommended. And if that isn't bad enough, it turns out that that famous painting of the Last Supper (who painted it again?) isn't in Florence as you thought, it's in Milan, where you were last week. Damn. So why on earth did you bother coming to Florence? I mean, what's here? (anything else from The Da Vinci Code?) And what can you get for free? But all is not quite lost. There's still Michelangelo's David in the Academia — that's 'famous' and always makes for a good Facebook album cover. But after queuing for two hours, you feel rather underwhelmed — David isn't the 20m high statue of a ripped male you had been expecting, and there isn't a secret passageway leading from his gluteus maximus to a torture chamber beneath the Vatican. So, after a hasty and overpriced pizza, you decide to just seek out the biggest, no nonsense building you can find and go in there — generally, it's that one that you see in the middle of the piazza with the big dome. So, slurping down the rest of that gelato, proudly smearing your face with chocolate and hazelnut, you queue up and enter. And that's where you meet me, with a smile on my face and a twinkle in my eye. Now, after this small exercise you might think that my job involves being martyred several times a day. But actually it's full of wonderful moments — it's been a great chance to think and to learn. Not long ago I was gardening in an orchard in the hills above the city. We were eating wild plums while we worked in the sun. It would have been quite the Tolstoyan scene, like Levin reaping the hay with his peasants, in search of truth and meaning through manual labour, if it weren't for the regular breaks and the constant plum eating. In the middle of the day we took a break and went to sit inside the small 11th century chapel on the hillside. 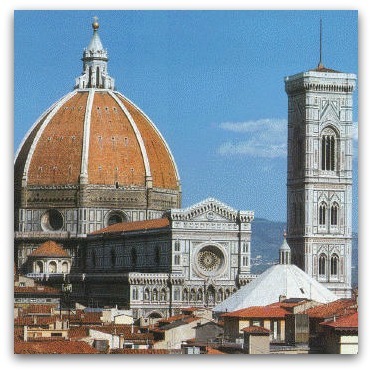 It was the first church in Florence to ring its bells in the year 1100 to usher in the 12th century. We were tired, so we lay down on the floor and looked up at the ceiling which was painted dark blue and covered with silver stars. For a lazy hour, we all tried to offer an interpretation of what the stars meant. For me they spoke of two things. Firstly, chaos — the universe as terrifying dark chaos surrounding the world, Milton's dark cosmos. But perhaps they speak of divine love as well: 'the love that gives this heaven its quietness' (Dante — Paradiso). It puts me in mind of D. H. Lawrence's description of the night sky in The Rainbow — 'the roaring sky' — which seems to speak of the cosmos alive with noise, but also, strangely, of its immense quietness. I think it's this quietness that overwhelms Alyosha in the Brothers Karamazov — he looks up at the night sky and then he falls down onto the snow prostrate. Even the simplest images in these churches are powerful — every detail conveys meaning, every detail adds to the cosmic vision the church offers. In Santa Maria Novella and Santa Croce, and even in the humble chapel on the hill, each piece of art seems to be a unified whole, its own limited world, imbued with an iconic presence — and together, each artwork in relationship with others, they form an 'iconographic atlas'. One night we went to the Duomo to hear a visiting men's choir. They sang beneath the dome and the Cathedral was dark. It was a wonderful moment, the Russian Orthodox choir singing next to the plaque commemorating the Council of Florence. It reminded me of St Sophia Cathedral in Novgorod, the darkness and the voices. So the night sky and the icons seem to play a similar role — they evoke the 'space of heaven', the depth and breadth of divine mystery — standing in front of an icon involves chaos, a loss of control, a sort of submission. And the night sky also symbolises a loss of control, the earth sailing through the universe, alone, vulnerable amidst a vast dark cosmos. Taking tours in the Duomo has been a wonderful experience. Leading the gelato stained crowds about the church definitely has its frustrating moments — people can be amazingly rude or depressingly unimaginative. But most often, they're just curious. It's a space filled with story, and people love to hear stories — of the Council of Florence and of Constantine XI, the last emperor of Byzantium, and the vision of eternity depicted in the dome, in Vasari's frescoes. I hope what they see then is that everything in the church is part of what Archbishop of Canterbury Rowan Williams described, in his book Dostoevsky: Language, Faith, and Fiction, as 'a subtle and resourceful symbolic world'. And perhaps it all comes together as a reminder to look upwards — again in Williams' words, as 'a reminder of the depth behind all the exchanges of discourse, a depth offering not a simple last word but an assurance of some foundational energy that keeps human narrative open to absolution, whatever occurs'. In the evenings, a group of us sit on the terrace outside the monastery of Santa Marta, and watch the sun go down behind the Florentine hills. Then the lights come on over the city below, and the olive trees change colour slightly. Benedict Coleridge is a recent honours graduate of the University of Melbourne. Recent articles by Benedict Coleridge. A required read for those commentators on Paul Collins's article re Vatican money (14 August) who see the artworks in the Vatican only in terms of their potential financial value. "Don't do it, Erik." "But I have to; I can't let it go unchallenged." "Don't - people don't accept the argument." "But there's integrity - I have to and I will so here goes: Ben, 1100 was the last year of the 11th century; the first year of the 12th Century was 1101, just like the first year of the first century was 1 AD, not 0 AD"
The article and the comments made my day. Thanks Benedict for your sharing of time spent in Florence. I have visited all the places you mentioned and rejoice in your experience of pondering the artistic and cultural wealth this great city offers to pilgrims. I have studied Art History in Florence and Venice an experience of a life time. I was refused entry to see David because I had a bike wheel with me, awaiting a bike shop to get it fixed in. The cloak room refused to take it in and they wouldn't let me carry it around (I had no problem with not being allowed to take it in to David, I must say), so I missed out. A long list of 'no entry' items appeared above the cloakroom window hatch and I pointed out the lack of prohibition on bike wheels, as they had with umbrellas and other such dangerous items. But there was a David overlooking the city that I had already seen, and that had to suffice, with imagination playing a larger part than if I had gained entry to the secure room. Dark shadow, I don't love you anymore. (You're deadly, the sea of Ezekiel; the flame forever roiling the bush ...) I don't think I ever did.